AUTONOMOUS by Andy Marino is a Must-read for ages 14 and up! : Special Guest post by Andy Marino! You are here: Home / Media Reviews / AUTONOMOUS by Andy Marino is a Must-read for ages 14 and up! 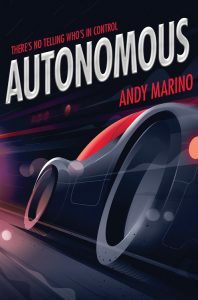 AUTONOMOUS by Andy Marino is a Must-read for ages 14 and up! 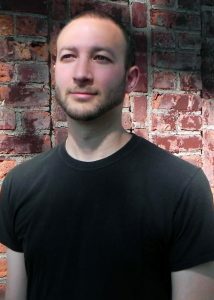 Special Guest post by Andy Marino! AUTONOMOUS by Andy Marino (Freeform | On Sale: April 3, 2018) Combines social media stakes with jaw-dropping, high-tech action for a road trip saga like no other. The Fast and the Furious meets Stephen King’s Christine in this story about a group of friends and a cutting-edge driverless car (OTTO) that taps into their online profiles, unlocking deep secrets that put the entire group in danger. Readers are encouraged to buckle up—once inside Autonomous, there’s no escaping until the finish! We have a special Guest post by the Author! Question: Where do you think Otto would take you on a road trip if the car tapped into your computer? Andy Marino’s answer: Otto would figure out pretty quickly from Instagram that I like playing music and going to shows, so he would probably start by planning a trip around those things. I think he would take me across the country to all the famous venues I’ve always wanted to see, like Red Rocks in Colorado and the Hollywood Bowl in Los Angeles. But that’s too easy for a sophisticated AI like Otto to be satisfied with for very long. He would dig a little deeper to find out that my musical hero is John Frusciante, the former guitar player for the Red Hot Chili Peppers. Our road trip would end at John Frusciante’s house in California—and in true Otto fashion, he will have failed to understand that you can’t just show up at somebody’s house unannounced, so Mr. Frusciante will probably be alarmed to find a total stranger in a prototype driverless car in his driveway. Look for AUTONOMOUS at a store near you or online! Self Disclosure: I participated in a Blog Tour and received a copy of the book to participate. No other compensation was received and I only feature books that I recommend. This one is great for ages 14+.